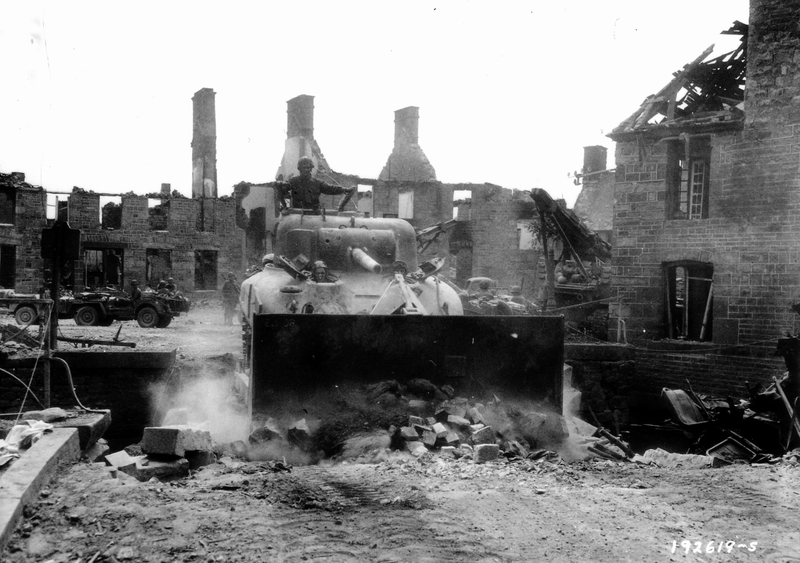 #12 The Sherman’s Armor: It Was Better Than The German Armor Of Comparable Weight. 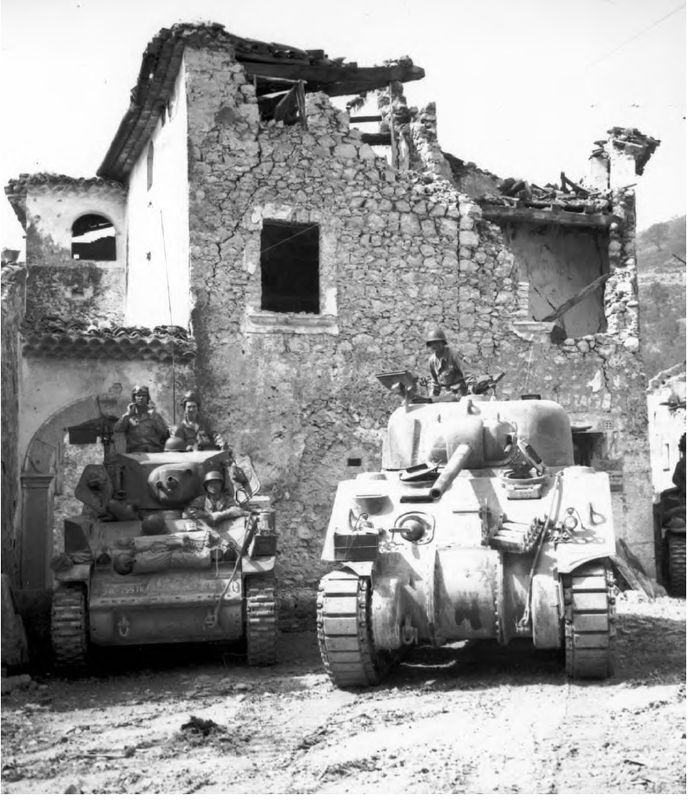 The Sherman’s Armor: Not As Bad As People Like To Say It Was. The M4 had well-balanced armor in the same class as the other medium tanks of the war. We have covered ‘welded’ and ‘cast’ hulls, but even the ‘welded’ tanks used many cast parts welded to the plates. 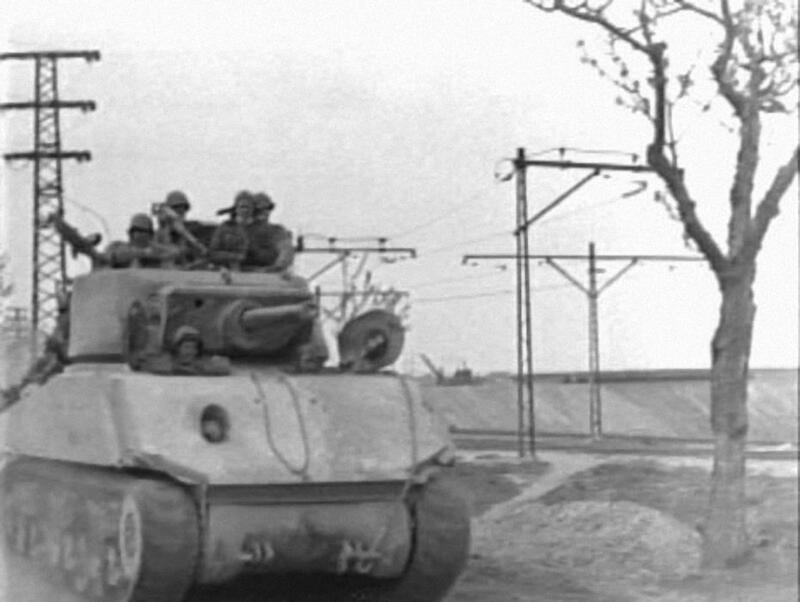 In either case, all M4 Shermans used rolled homogenous, or cast homogenous, steel armor. It was well balanced between hardness and ductility and was resistant to spalling and cracking, and was easy to repair and weld. 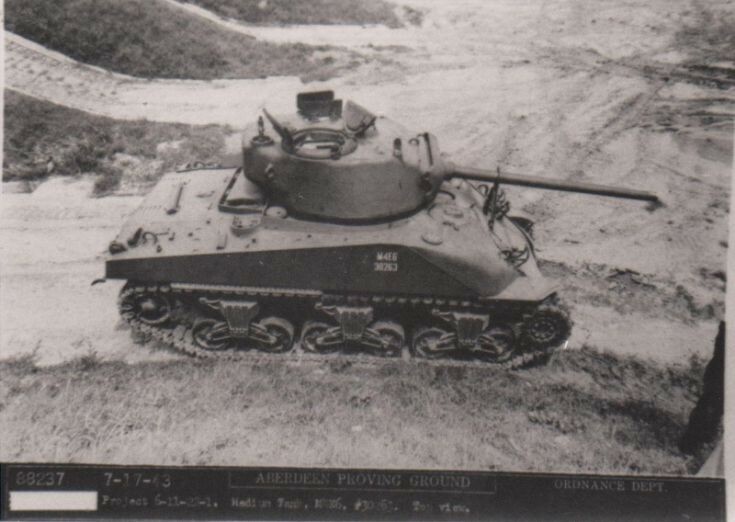 All versions cast or welded had sloped frontal armor, but the early welded Shermans had a lot of weak spots due to all the welding lines, and thinner armor used in the driver’s hoods. This was solved by adding external plates in front of the hoods. Over time the front plate was simplified to eliminate as many welds as possible, and the later large hatch hulls used a single plate. Most early welded Shermans used cast armor plates welded together to form the front hull plates. 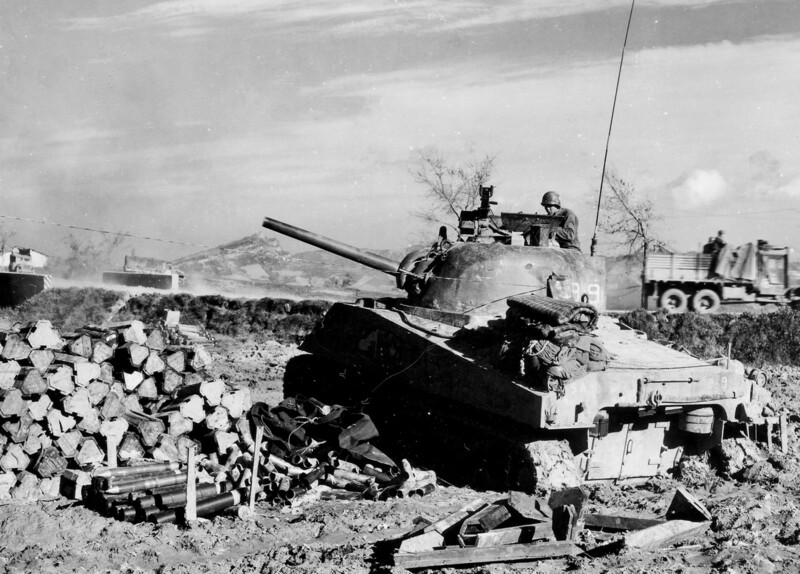 A mid-production M4 Sherman had 2 inches of armor at 56 degrees. The hull sides were 1.5 inches at 0 degrees, the rear was also 1.5 inches at 0 to 10 degrees. The hull roof was .75 of an inch thick and floor 1 inch under the driver and a .5 inch everywhere else. 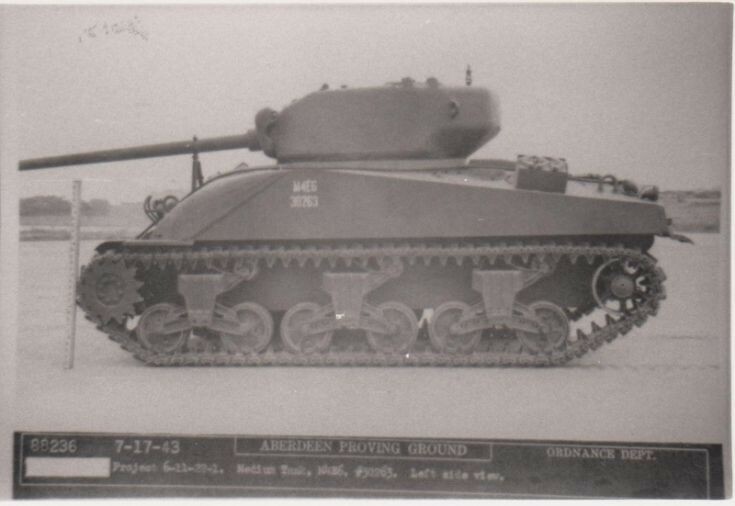 This version of the Sherman was welded; the front plate was made from many smaller plates welded together, with the cast fittings welded in place as well. This was a lot of welding, and one of the reasons why the cast version was well liked from a manufacturing perspective because it took a lot fewer man-hours to produce, the problem was, not all the factories could do the large castings. The hybrid hulls were a solution to the casting capacity problem since more factories could handle the much smaller front casting the highbred used a casting on the front of the hull, and the rest of the hull was welded and very similar to the standard M4 hull. In some cases, when cast parts were called for, but if there was a shortage, a particular tank maker might come up with their own built-up part instead of cast fitting. This is one of the major reasons why there are so many little details differences between each factories version of the tank, they each left a signature on the fittings they used and how they installed them. These details are the thing of nightmares for a scale modeler who really needs to get the details right, the classic ‘Rivet Counter’ could be driven insane by all the places they could go wrong on a Sherman kit. The M4 would have a cast, 75mm gun turret. These turrets had 3.5-inch thick gun shields, a 2-inch rotor shield, and 3 inches of armor at 30 degrees on turret face. The sides were 2 inches, and the rear 1. The top was 1 inch thick. This turret armor was the same throughout the 75mm turret run, though many early castings had a weak spot on the frontal armor, near the gunner, this was covered with a large section of welded on armor, and the casting was improved in later versions of this turret, thickening the armor over the weak spot so the add-on armor was not needed. This is much better armor than say the armor on the PIV, and very similar to the armor on the T-34. Most of this mid-production tanks would not have a loader’s hatch unless it was retrofitted at a major tank factory, but this would only be done when a tank was being completely rebuilt. A mid-production M4A1 would have the same turret, but the hull armor was cast and would be 2 inches at 37 to 56 degrees. The rest of the armor, with the exception of a few places in the hull roof as thin as .5 of an inch, was the same, and there was a contour difference inside the hull. Many of the cast fittings welded onto the M4 would be cast directly into the hull of an M4A1. All spare parts would be interchangeable between these two tanks. The Shermans armor was pretty good against 37mm and 57mm anti-tank guns. It was ok against 75mm guns like the one mounted on later production PIV tanks. Anti-tank guns larger than 57 mm could be hard on the Sherman and some guns could cut through them like butter. This was no surprise to the US Army, and they had a whole plan worked out to use infantry, artillery, and air support in conjunction with tanks to help them deal with anti-tank guns and other tanks. The Shermans M3 75mm main gun was a very good gun for handling AT guns, it was accurate, had a high rate of fire and an excellent HE round. Even a tank with armor as good as the M26 Pershing or Jumbo was still vulnerable to AT guns 75mm and larger, being able to flank that AT gun or strong point was more important than being able to slug it out in the long run. 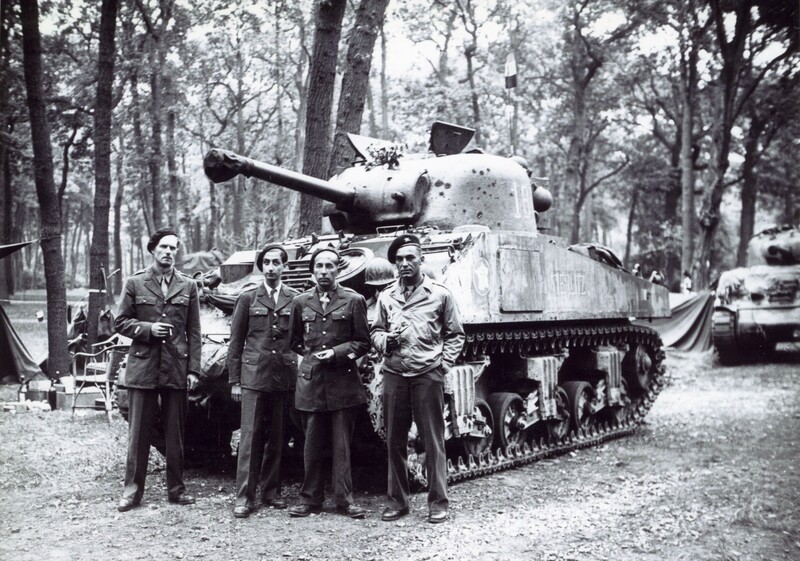 Without AT guns, enemy infantry had a very tough time with the Sherman, and even the Panzerfaust wasn’t all that effective unless used very close to the tank, and if the Shermans had infantry working with them and could hang back a bit, the Panzerfausts were much less effective. In the Pacific, Shermans would really help defeat the Japanese and then be forgotten about, barely mentioned in most books on the PTO. You may not hear much about the M4 in the Pacific, but it saw a lot of action. A few of these Shermans are still out there, some rotting away in the surf for tourist to play about on, in Saipan, Tarawa, and I think Guam too. There’s still an M4A3 rotting away on Iwo Jima. The Japanese saw them as the most serious threat they would face and used some desperate tactics to kill them. Basically, the Japanese used man powered mines and shaped charges, and or the largest caliber guns that could be aimed at the tanks. They also had a rare but effective 47mm AT gun as well. In many cases, just getting the tanks ashore killed a large number of them off with things like holes or shell craters in reefs. Later production tanks with the improved large hatch hulls, in some cases would still have the 75mm gun turret, these tanks would all have final production turrets with loaders hatches and cast in improved cheek armor, or early turrets retrofitted with the armor and hatches. Most of the large hatch hulls would have wet ammo racks, but a few large hull tanks, mostly M4A2 75mm tanks got the large hatches but standard ammo racks, with the add-on armor. These large hatch welded hulls had a simplified one-piece front plate. It was now 2.5 inches thick at 47 degrees. The improved final drive (lower hull) housing offered 4.25 to 2 inches of armor. The rest of the hull armor thickness stayed the same, but it was not only stronger from being thicker, but many of the ballistic weak spots and welding joints were gone. Even these later large hatch hulls, only produced at three factories, have many minor cosmetic differences. The M4A1 received and improved large hatch casting, and its frontal armor and slope changed as well. It was 2.5 inches at 37 to 55 degrees and the rest of the hull remained the same thickness. Many of these large hatch hulls had the larger and T23 turret. This turret had a 3.5-inch thick gun shield, a 2-inch rotor shield and front armor of 3 inches. The sides were 2 inches thick and the rear 1, the top was also 1 inch thick. All these turrets had loaders hatches. They were also made from castings, just like the 75mm turrets. Many tank divisions modified their tanks with add-on armor. The most common was sandbags. They many units came up with very elaborate steel frames welded to the hull to hold the sandbags in place. Even though army tests showed that sandbags did not help much, this was still popular. Patton banned their use in his 3rd Army. Another thing they came up with was adding a several inch thick layer, usually three to four, of concrete, to the front and sometimes the sides of the tank. This armor was little better than the sandbags. 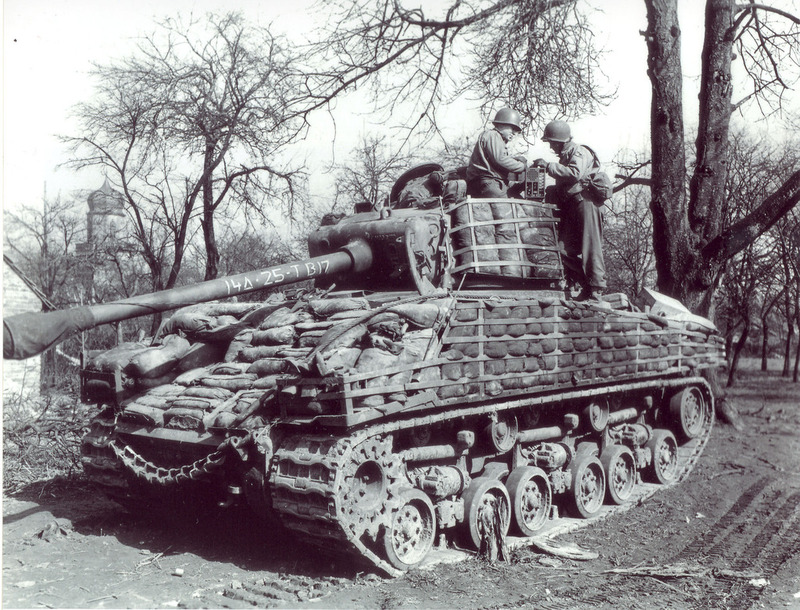 There was a field armor upgrade that did work well; it was employed extensively by Patton’s 3rd Army. 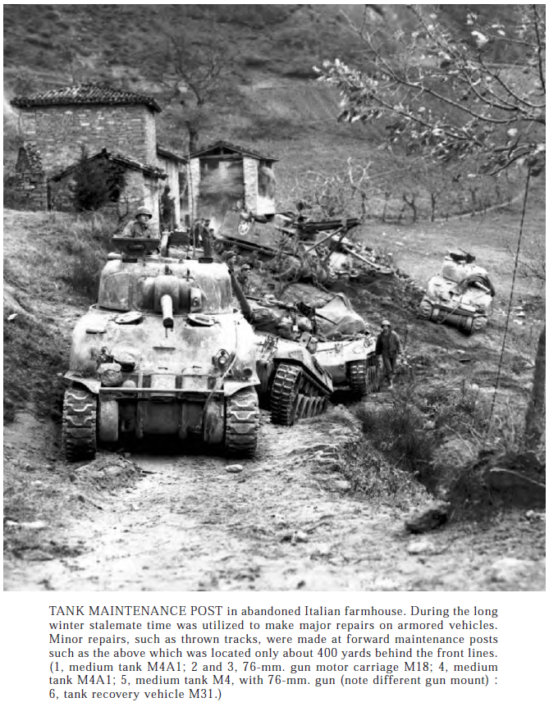 By this point in the war, late 44, early 45, there was an abundance of large hatch 75, and 76mm tanks in use. 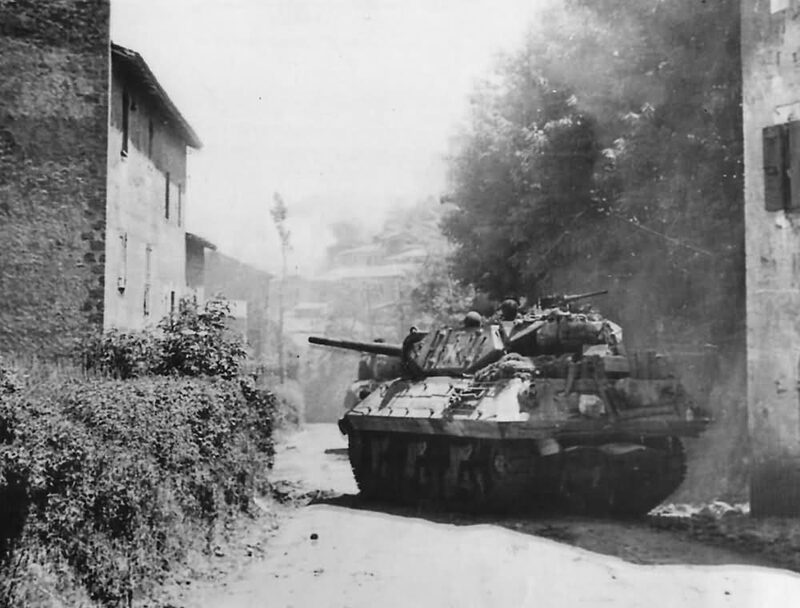 They would take the armor from knocked out tanks, often large hatch Shermans, and cut off the whole front plate, and weld it onto the front of an M4A3, A3E8, or even A1 tanks. 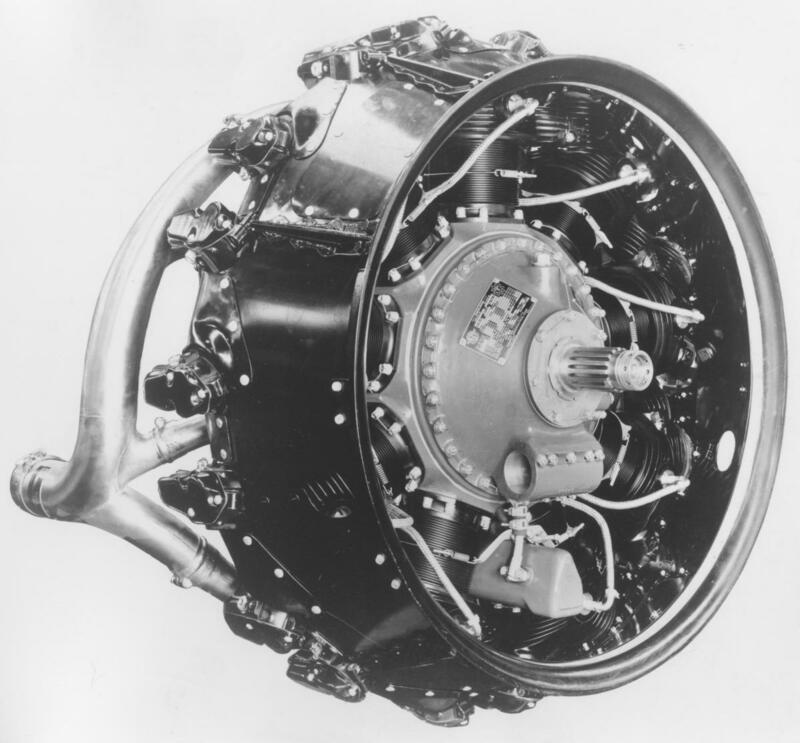 They would also add an armored plate extended over the differential housing in many cases. They would also upgrade the turret armor by adding extra plates around on the turrets cheeks on 76mm turrets. One famous example of this upgrade package is General Creighton Abrams’s personal tank, an M4A3E8 76 tank, named Thunderbolt VII. This armor package was found to be almost as effective as the Jumbos armor and didn’t put as much strain on the tanks automotive bits as the sandbags and concrete. Steven Zaloga’s Armored Thunderbolt and Armored Attack books have extensive pictures of all the armor modifications and their use in action. 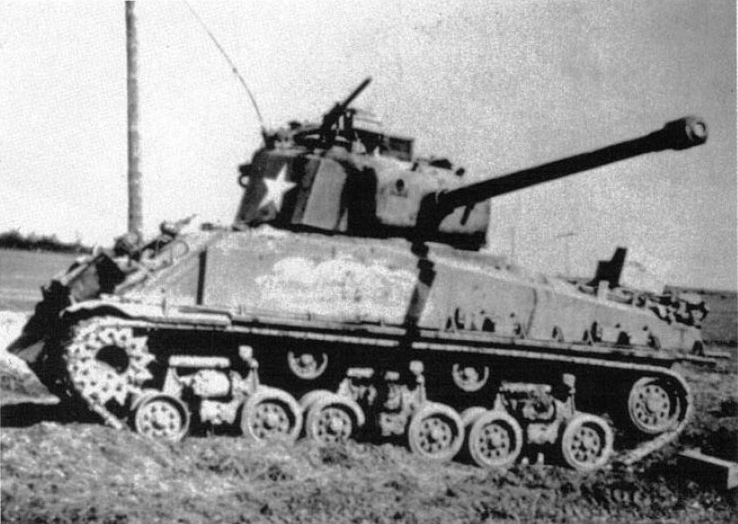 M4A3E8 with add-on armor plate.